There are two seperate CDs here but they are sufficiently similar to be reviewed together. Set one, volumes one to 14, is on one CD, and set two, volumes one to 29, is on the other. In spite of this weird numbering, each CD holds data from different parishes. All volumes in set two are for those parishes in the Diocese of Lichfield (misspelled as Litchfield throughout) situated in Shropshire. Both sets are PDF files, full searchable, complete with bookmarks, and with S&N's auto-start interface. The bookmarks point to each parish (some volumes have more than one parish so you're getting a lot of data), the registers then being arranged by year. 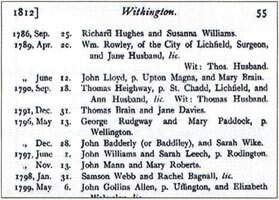 Originally published by the Shropshire Parish Register Society, each volume also has a place and name index, although page numbers don't correspond. For each parish there's a short description and history, sometimes with population figures, comments, and sometimes a list of clergy too. The records stop in 1812, with varying years of commencement in the 16th to 19th centuries.